(MoneyWatch) Ben Bernanke and other Federal Reserve officials are in no rush to take away the punch bowl. In a news conference, the Fed chairman said Wednesday that the U.S. economy continues to heal, but suggested that it is too soon to start tapering the central bank's $85 billion in monthly bond purchases. He also emphasized that monetary policy will continue to support growth even as the economy gathers strength. But Bernanke said the slowdown in purchases could start "later this year." The Fed could pull the plug on the program in mid-2014, when unemployment is forecast to be 7 percent. He also reiterated the Fed's previous message that tapering does not amount to raising interest rates, noting that there would be a gap in time between when the Fed ends the bond program and the first rate hike. Most FOMC members see that initial rate increase taking place no earlier than 2015, the chairman said. The Federal Open Market Committee, the Fed's 12-member panel that sets monetary policy, said in a statement ahead of Bernanke's comments it will maintain its pace of monthly bond purchases. The FOMC said the economy is growing at a "moderate pace," while noting that tax and spending policies are hurting the recovery. The FOMC predicted annualized growth for the year of 2.3 percent to 2.6 percent and of 3 percent to 3.5 percent in 2014. The job market has shown "further improvements" in recent months, the committee said. It expects the unemployment rate, currently at 7.6 percent, to fall to around 7.2 percent by year-end. "To support continued progress toward maximum employment and price stability, the committee expects that a highly accommodative stance of monetary policy will remain appropriate for a considerable time after the asset purchase program ends and the economic recovery strengthens," the FOMC said. Although the Fed is standing pat for now, the FOMC did set the stage for a policy shift by highlighting what it sees as the brightening economic picture. It noted that "the downside risks to the outlook for the economy and the labor market as having diminished since the fall." 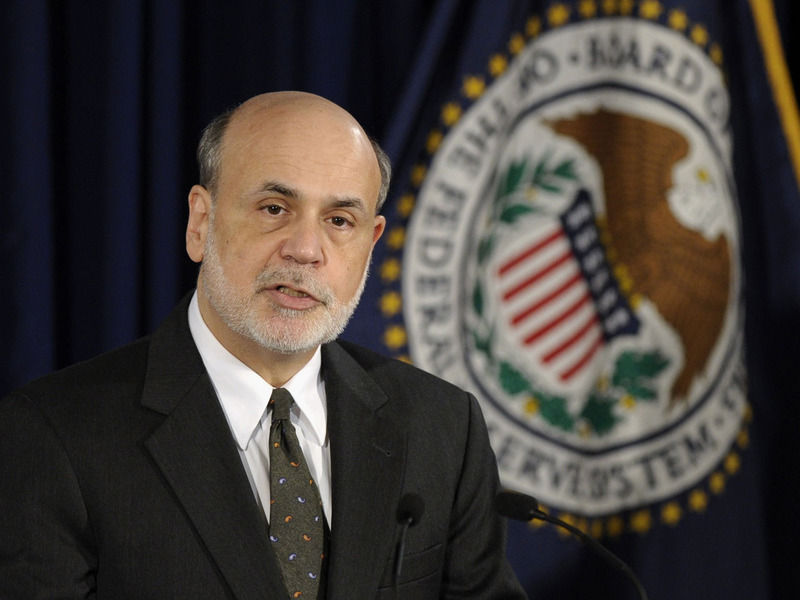 "The fundamentals look a little better to us," Bernanke said. "In particular, the housing sector, which has been a drag on growth since the crisis, is now obviously a support to growth. It's not only creating construction jobs, but as house prices rise, increased household wealth supports consumption growth [and] consumer sentiment." Stocks, which have risen this week on expectations that the Fed would continue its bond purchases more or less unchanged, fell immediately after the FOMC statement and continued to sink while Bernanke addressed the assembled media. At closing, the Dow Jones industrial average had lost 206 points, or 1.35 percent, to 15,162, while the broader Standard & Poor's was down 23 points to 1,629. The Nasdaq composite retreated 39 points to 3,443. Investors have been eagerly awaiting the Fed's latest economic snapshot for clues about when the central bank plans to start scaling back its monthly purchases of Treasury and mortgage-backed bonds. The Fed began that policy, known as quantitative easing, in 2008 to help arrest the plunge in economic activity that followed the housing crash. The goal: curb longer term interest rates in order to stimulate borrowing and lending, while also shoring up the stock market. Now, the prospect of the eventual end to QE3, as the third and latest round of quantitative easing is known, has roiled financial markets around the world. The Fed hasn't helped matters by appearing to waver on its plans. Stocks have whipsawed since May 22, when Bernanke told the Joint Economic Committee in Congress that dialing down QE3 prematurely would hurt the recovery. But in congressional testimony that same day he seemed to temper that message by saying the Fed might begin withdrawing support over the next few months if the job market continued to heal. Investors were further confused by the release of notes from the central bank's previous policy meeting last month showing that some FOMC members favored reducing the volume of bond purchases as early as June. The mixed messages immediately caused stocks to fall as investors worried about an imminent end to the Fed's bond purchases. The price of bonds also fell while their yields rose, raising concerns that rising interest rates could damage the recovery. For Bernanke, meanwhile, anxiety over the direction of monetary policy underscores a thorny challenge: How to communicate clearly to financial markets what the Fed plans to do without shackling the bank to policies that might need to shift as economic conditions require? "The key point is that our policies are tied to how the outlook evolves," Bernanke said today in response to a reporter's question. "That should provide some comfort to the markets because they'll understand that we'll be providing whatever support is necessary." Of course, that is the usual test for Fed officials as they yank the monetary policy levers to keep the economy on course. But the task is made harder now by the delicate state of the recovery. Despite slowing growth related to mandated government spending cuts that took effect in March and a January hike in payroll taxes, most experts think the economy is gaining speed. They expect GDP to accelerate in the second half of the year and for job-creation to gradually whittle down unemployment. "Because of multiple headwinds, it has been difficult for the U.S. economy to gain momentum and grow at rates that are more typical of an expansion," said economists Nariman Behravesh and Sara Johnson of IHS Global Insight in a note to clients. "The January tax hikes and the subsequent spending cuts have reduced real GDP growth by about one percentage point in 2013. As the impact of this fiscal tightening dissipates, growth will rebound to 3 percent or higher by early next year." Such growth would spur hiring and more broadly nourish a virtuous cycle of spending and economic expansion. But the strength of the recovery depends in part on a smooth exit by the Fed from its extraordinary financial support for the economy, especially with lawmakers on Capitol Hill still bitterly divided on fiscal policy. "It makes sense to delay any reduction in monetary stimulus for a few months while the fiscal drag linked to the sequestration cuts to federal spending is at its peak," economists with Capital Economics said in a research note ahead of the FOMC's latest forecast. "Our best guess is that the Fed will wait until the September meeting and that even then the tapering will begin with a very modest reduction in the monthly purchases, to perhaps $65 billion per month."